It was evening time and we were standing under one of the big date palms that flanked either side of the gables when we heard the droning of an aeroplane. Then suddenly it came into sight – a big fat-bellied plane of a dull colour. It flew low low over the hedges and then circled and flew even lower, belly flopping along the long hedge that ran parallel to the lagoon. It disappeared behind the hedge, near the grain silo, and out of sight. Suddenly there was a loud bang. 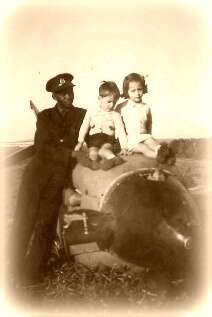 My father, grandfather and the farm workers rushed up to the top field and there, belly down in the field, was the plane, intact. I do not think that the pilot was injured but I do not remember him. Just the horrible feeling of seeing the plane lying there and wondering if there was anybody hurt inside, or if it was suddenly going to burst into flames. Sometimes my cousins used to visit, and I loved it. They would come for the week-end and we would play all day. These cousins were all older than me, and I had to run to keep up. 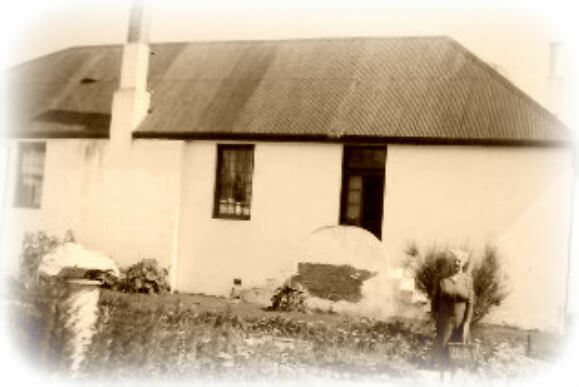 They would pile out of the car, quickly kiss Grandpa and Granny hello, and be off, careering down the farm track that ran parallel to the lagoon – for further along this track were the workers’ cottages, and more importantly for us, children. These cottages were quite square, with a stable door in the middle and fat chimneys on the outside. Each had two small windows opposite the door. They stood right at the end of the great avenue of eucalyptus trees, and from there you could look over the wetlands, across to the water lapping at the edge of the lagoon. There weren’t many houses, maybe three, but in there lived the loveliest of families. 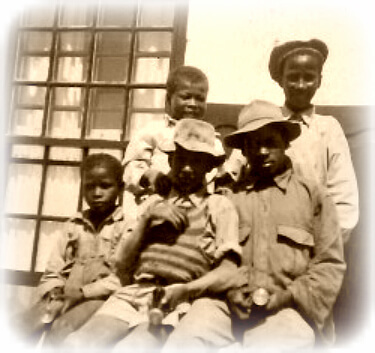 They were the Blaauw families, gentle people whose history went back as far as the Cape itself. Old Leah, our cook was a Blaauw, and beautiful Lena, our nanny, whose tiny baby Kathy was learning to crawl along the flagged stones of the kitchen floor. I suppose you could even say kind and simple Mot, the foundling, was now a Blaauw. On one of my cousin’s visits I remember reaching old Leah’s house, and wanting to run inside, wanting to see what she had in store for us. Sometimes she would have a huge blackened pot bubbling on the wood stove and she would give us waatlemoen konfyt, all crispy and dripping with sugar. But this time she was leaning over her stable door, and she called out, ‘Kindjies, jy moet nie vandag inkom nie. Vanmore ek het mis op die vloer gesmeer and dis nog nat.’ ‘Little children, you must not come inside today. I have smeared manure on the floor and it is still wet.’ Cow manure used to be mixed with water until it formed a paste, and then smeared on the floor. I never remember it having any smell at all, and it soon formed a solid base, almost like cement. Mealtimes were always busy. We had a long wooden refectory table that could take eighteen or twenty people. Once on a Sunday a visitor came unexpectedly. He was a travelling person, and I think he may have been selling something. My grandfather asked him to join us for Sunday lunch, and we all sat down. It was roast lamb, and potatoes, and vegetables. The visitor sat on my grandfather’s left, and I sat opposite him, minding my manners very carefully. The visitor and my grandfather got into a very involved discussion about farming, and I sat, entranced – for as my grandfather was talking the visitor was slowly and carefully positioning his peas all along his knife, from the handle to the tip. Once they were all perfectly balanced, he steadily lifted the knife until it was level with his mouth, then tilted it, and unbelievable! The peas went rolling down his throat. Nobody seemed to notice, but I was lost in admiration. At that time we had the most beautiful black stallion. He was a great big horse with fine strong muscles and a magnificent body, and his name was Kim. He had cost a lot of money and he was sick. Three times that week the vet had been, and he was to come again the next morning. ‘That’s it then,’ said my father, ‘the vet must have been trained in all sorts of sicknesses and spots aren’t too difficult to diagnose.’ I was terrified of this vet coming and I couldn’t sleep that night. I had seen the huge horse needles that he jammed into Kim’s flank. The next day my cousins arrived and I had the most miserable time – for they wandered all around the farm and I had to trail a safe distance behind them. Years later I got measles again, so I do not think that the spots that vets are trained to see are the same ones as in humans. ‘Never have anything to do with horses’, my father would say. ‘there are only three things that are worth knowing about them: They bite in the front, they kick at the back, and they are bloody uncomfortable in the middle.’ My father didn’t like them when he was put onto Geelbek, and he held this dislike until he left. At first my father would take my mother out riding, and I can remember them setting off in the afternoon, and leaving me behind with my grandmother … my father with his sandy hair and fair skin, and my mother with her blue-black hair and her beautiful olive skin. There had never been anyone else in my father’s life. He liked to tell me about other girls that fancied him, and how he had fallen asleep on a farm road once after taking a local girl out, and he had woken up as the old Chev car came to a standstill between two gum trees, but even then I knew that this was just talk that men do. My mother was quite a bit younger than my father, and in those days he treated her as something very, very special… he was tremendously generous and kind, but even then he could be hasty with his words. 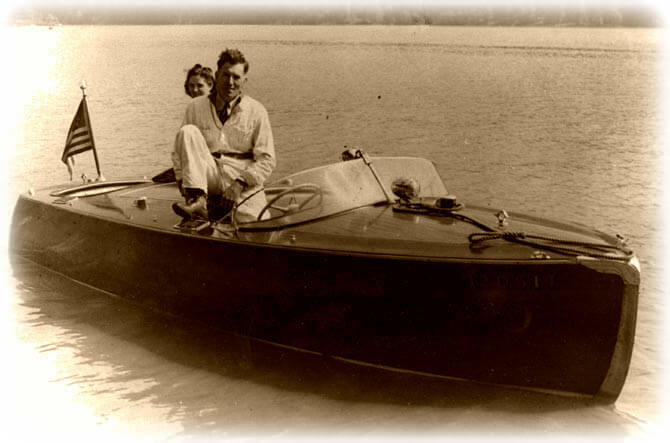 My mother was never as adventurous as my father, and she loved her home and home-making more than anything else. One afternoon when they were returning from a ride she kicked the gate open with her foot and the stirrup got tangled up in the gate latch and she was dragged off her horse. I don’t think she was hurt, but she never rode again. And as I got older I was never allowed to ride either. ‘A horsey woman that smells of the stables is not what I want for a daughter’, my father would say, and the matter would be closed. When I couldn’t be with my father and my mother was busy, I used to wander around the farmhouse with my grandmother. It had an enormous kitchen, with a big open fireplace. Outside it had a funny little square thatched building. This was the meat house, for we had no fridges. The meat house had gauze windows and no glass, so that the wind could blow through and cool the inside. It had a heavy door and inside there used to be all sorts of hanging things – hams, a dead steenbok, or a whole lamb. 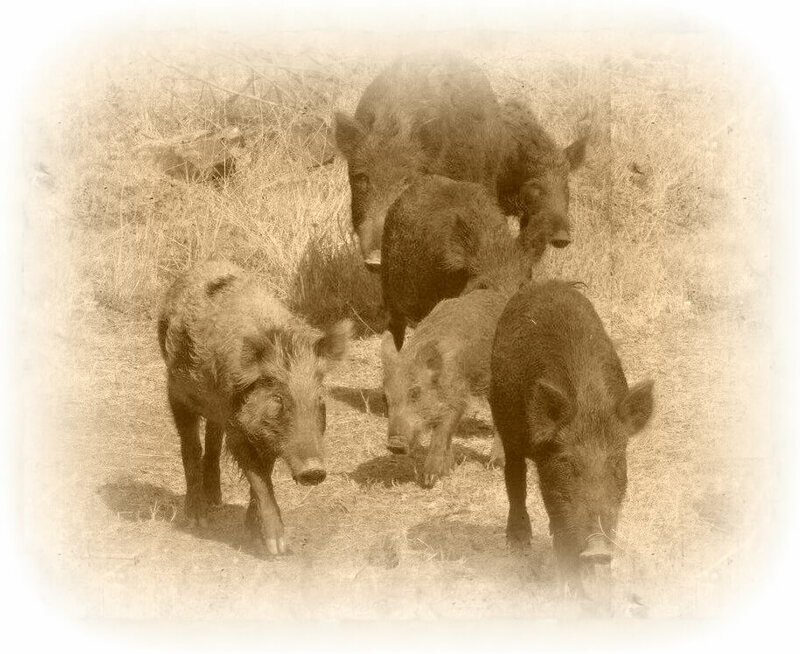 I do not think that we ate the wild pigs, but there were plenty of them on the farm. In the afternoon my grandfather used to put me on his lap and tell me stories about hunting these pigs, and how they ran down into tunnels in the reeds and how he and my father had to belly crawl down the tunnels slowly slowly after the pig. And then ‘whoosh …’ the pig would come careering up the tunnels at full charge and they were in danger. ‘Quickly, quickly, shoot it!’ he’d cry and drop back into silence, and I would think how I had nearly lost my grandfather and my father to this terrible wild pig. I used to think that these hunters in my family were very strong and powerful, and never in our household at that time did the womenfolk ever question their authority. Even my mother. The women’s work was to look after the home and the children, and that was the order of things. My grandmother was the head of the house, she did the ordering and the catering, and that too was the way things were. 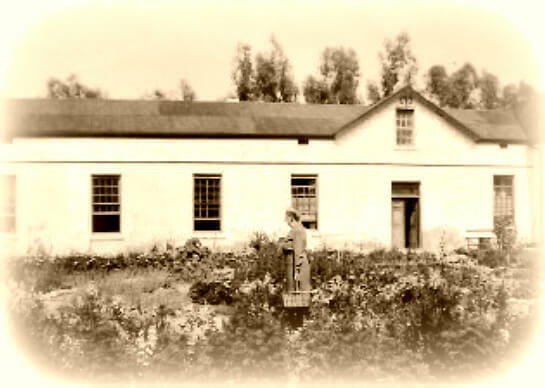 Once the routine of the house was on the go, my grandmother would work in her garden. She had a little trowel for me, and I remember working busily alongside her. I remember too the smell of lavender and rosemary, and the huge bumble bees that used to hover around my green-lined khaki sunhat. Once I found a tiny bird, I think that it must have fallen out of one of the finches’ nests. Grandmother and I took it into the house, and we found an old shoe-box. I layered this with dried grass and placed the little bird into it. Granny taught me how to chew white bread into pappy bits, and then hold its beak to my mouth and prize the tiny beak open with my tongue, pushing the bread in. But the little bird died the next day. I don’t remember crying. Perhaps the rhythm of farm life and the harshness of the environment makes people tougher. Once my grandfather had the most terrible argument with my grandmother, with the whole house, I do not know what it was about, but I can still feel the atmosphere and the trembly sound. He took himself off to his room, across the coir matting of the big enclosed veranda, up his little stairs where the gabled wing was, and shut the door. He did not come out for three whole days. I thought he might be dead. Nobody said anything, and when no-one was looking I would climb the stairs and sit quietly, quietly, curled up next to the door to see if I could detect signs of life. The most amazing thing of all was that my grandmother would take him his food. Three times a day she would dish up a plate of food for him, and silently place it outside the door. She didn’t knock, she just went away. Then, later, the plate was back outside the door, empty. Along with his brothers, my father owned a brickfield. It was situated on the back slopes of Table Mountain, where the stone pines lie down in obedience to the wind, and the Tahrs sometimes stray. My very first memories of this father of mine were him coming home late at night. He used to stand at the kitchen door leading in from the yard and take off his big brown working boots that stretched up past his ankles. All I could see of his face were two white patches around his eyes, and the rest seemed to be mud, or a sort of packed clay. That was when the kiln gave trouble, and he was so tired. I used to run and give him the pumice stone so that he could scrub his hands at the kitchen sink, and my mum used to run his bath. 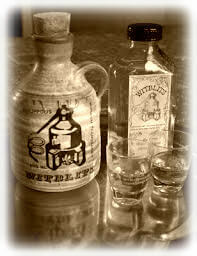 Then he would come and sit, all steaming clean in the lounge, and drink a glass of witblits. I used to mix it for him and the smell was amazing – a tot of witblits in the bottom of the glass, a level spoon of sugar and hot, hot water from the tap. What steamed up from that glass was something like liquorice and there was always a sense of awe about making this drink because my father was one of the most law abiding people I knew. ‘Always tell the truth,’ he would say, ‘and then you will see that the trouble is not half as bad as the worry about keeping quiet.’ But having this witblits was against the law. My father got his supply from a friend who lived high up in the mountains at a mission station. She was the primary school teacher there and twice a year she would come into Cape Town, and on these visits she would bring these huge glass bottles with handles on their necks. They were filled with this ‘white lightning’ and my father would laugh and thank her and say she must be one helluva teacher, not like they had in his day. Then he would lift the Persian rug in our hallway. Under that there was a neat square cut into the wood. You could hardly see it, but then two of my father’s brothers were carpenters and they were all good with their hands. Down into the ‘smokkelgat’ the precious witblits would go. The doctor told my mother that my father should sit down every night and have a drink before he had his supper otherwise he would never sit down. But she couldn’t get him to have a drink because in the war he used to swop all his cigarettes for whisky, and that way he got to drink a bottle a day. When he came back from the war his nickname was ‘Whisk’. The brickfields had belonged to my grandfather, and when I think very hard I can remember beyond my father, to the time when my grandfather was alive, and we all lived on a farm. I can’t remember what he looked like, but I can remember his presence very well. He seemed a very strong man and I think he ruled our house completely. 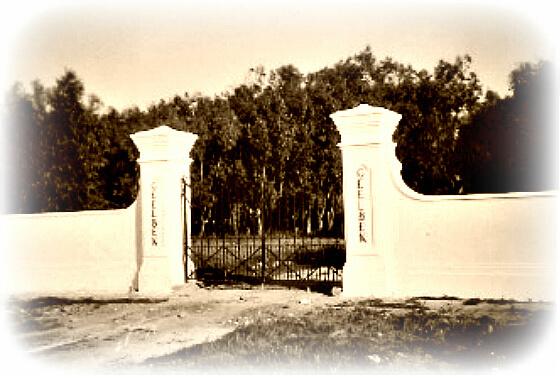 This farm was on the edge of the Langebaan lagoon and it was called Geelbek. This was after a fish like that, although I never saw one. 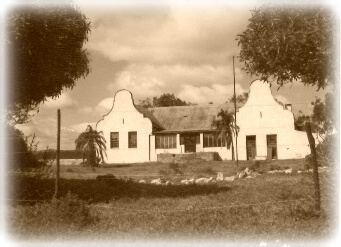 The locals called the farm Twee Gewels, because the front facing the lagoon had two huge white gables. When the sun was setting over Churchaven way the gables glinted and shone right across the water. 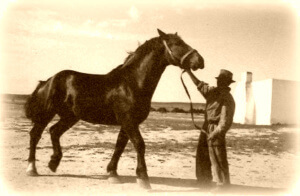 My grandfather had bought the farm just after I was born, and he ran horses on it. 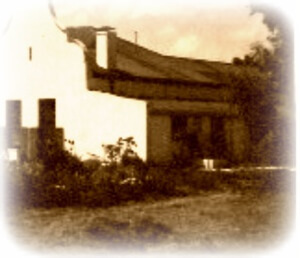 My father and my mother had to pack up their little house in Mowbray and move to this farm so that my father could help run it. But my grandfather ran it very well and my grandmother ran the house very well too, so there was plenty of time for me. It was here that my brother was born, and it was here that I began to run free with my father. I was his shadow and where he went, I went. This was to cause me great trouble later, as no boyfriend was going to be readily accepted. But right then we spent our days together. 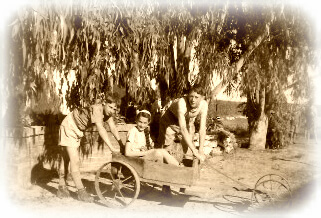 Of the children living on the farm I only remember Louise and Mot. Mot’s real name was Moses. Old Leah, our cook, had named him that. One misty morning she had been walking along the edge of the lagoon – along that part where the flamingoes stand on one leg and the mists roll in from the sea. At first she thought that the sound she heard was the thin wail of the seabirds, but there was something about that cry that tugged at her heart. She stopped and listened. Something about that cry was terribly wrong. There it was again, a thin cry – the cry of the vulnerable, the unprotected primordial cry for help – and it was coming from the very edge of the lagoon. With that old Leah lifted her long skirt, and set off into the swirling mists, her stout boots stumbling over the strong tufted reeds as she ran. And there, right on the edge of the water, in a small clearing in amongst the bullrushes she found him. A tiny baby wrapped tight in swaddling clothes and placed carefully in an old wooden crate. There was nothing with him to show where he had come from. Nothing. By the time I remember Mot I think that he was about eleven, and everybody thought that he was a bit simple. ‘Mot is nie reg in die kop nie – Mot’s not right in the head,’ they would say. But for me he was just fine. He had taken to following me wherever I went, and my father was quite happy about this, as he felt that with Mot by my side I could come to no harm. So every morning I would wait for Mot and then the two of us would start our adventures. “His name is Moses …” Mot, seated on the left. First we would go past the big dam where my cousins used to swim and sail in a tin canoe when they came visiting. Then we would walk along the sandy path and under the huge flowering gum tree to the gate in the hedge. I hated going through this gate, because there, on the other side, were the geese, with their long craning necks and forward pointing beaks, and they would hisssss – and peck your bare brown legs if you didn’t run fast. 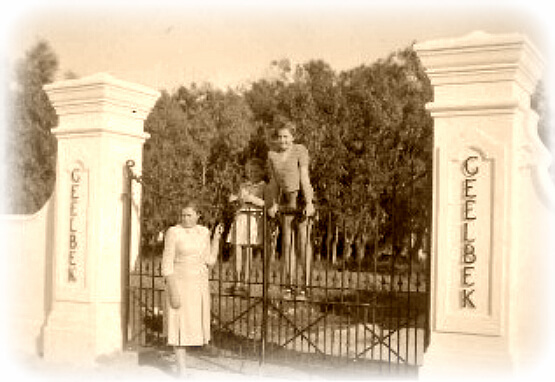 But beyond the gate was the farm manager’s wife, Mrs Ferreira, and Louise, who was my age. Mrs Ferreira’s kitchen was small and cozy and always smelt of bread baking. She was a very large woman and she would cut big, thick slices of bread and spread them with goat’s fat and give them to us. I was always skinny and pale, and I think she thought that the big house fed me on quite the wrong diet. Then off we would go, after my father, to look at the horses. I was completely in love with the horses. We had lots and lots, and most of them were wild. I can remember them running free, across the reeds and wetlands when the tide was out, their manes streaming out behind them and the mists swirling around them. In the mists they snorted, and the sound seemed to magnify and carry itself across to where I would be perched on a fence with Mot, Louise and my father.